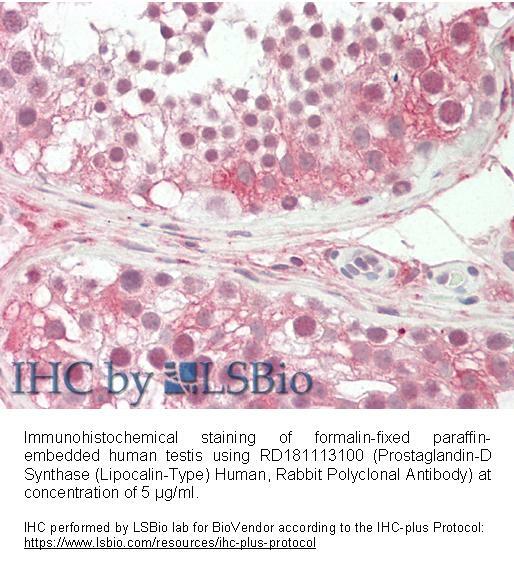 The antibody was raised in rabbits by immunization with the recombinant Human Beta-Trace Protein. The immunization antigen (20.3 kDa) is a protein containing 182 AA of recombinant Human Beta-Trace Protein. N-Terminal His-tag, 14 extra AA (highlighted). Immunoaffinity chromatography on a column with immobilized recombinant Human Beta-Trace Protein. BTP catalyzes the conversion of PGH2 to PGD2, a prostaglandin involved in smooth muscle contraction/re­laxation and a potent inhibitor of platelet aggregation. Involved in a variety of CNS functions, such as sedation, NREM sleep and PGE2-induced allodynia, and may have an anti-apoptotic role in oligodendrocytes. Binds small non-substrate lipophilic molecules, including biliverdin, bilirubin, retinal, retinoic acid and thyroid hormone, and may act as a scavenger for harmful hydrophopic molecules and as a secretory retinoid and thyroid hormone transporter. 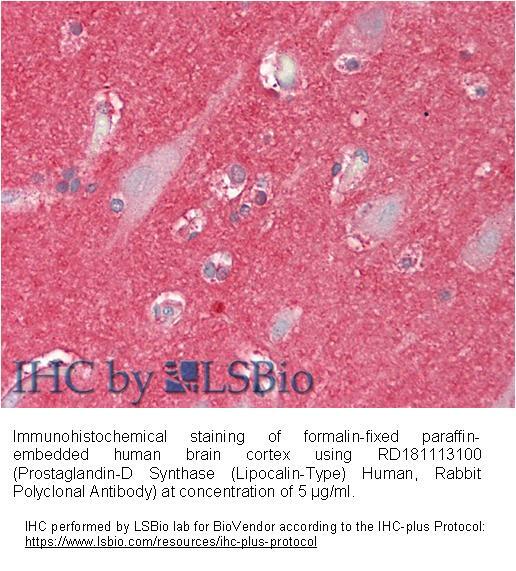 Possibly involved in development and maintenance of the blood-brain, blood-retina, blood-aqueous humor and blood-testis barrier. It is likely to play important roles in both maturation and maintenance of the central nervous system and male reproductive system. It has been proposed that the urinary and serum levels may provide a sensitive indicator of renal damage in diabetes mellitus and hypertension. Elevated levels in the coronary circulation may also be associated with angina. Changes in charge and molecular weight microheterogeneity, due to modification of the N-linked oligosaccharides, may be associated with neurodegenerative disease and multiple sclerosis. Detected in meningioma but not in other brain tumors and may be considered a specific cell marker for meningioma.